When you are travelling to a new location, a little preparation goes a long way. We used to have to visit a site to know what it looked like. With the resources available today, mostly through the Internet, you can research a location, have an idea of the view and know enough to pre-visualize some shots before ever stepping foot in the area. Google Maps – Start with Google Maps. Whether it be city streets or out in the country, Google Maps will likely have you covered with both maps, satellite imagery and even topographical information. Use this to learn the streets or terrain, including studying the satellite and topographical maps to get an idea of the lay of the land. Google Street View – If you are going to be in an area covered by Google Street View, this is an incredible resource. 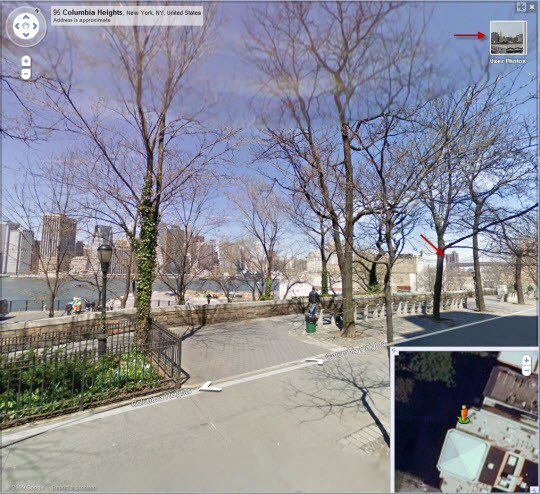 I recently went to the Brooklyn Heights Promenade in Brooklyn, NY for the first time and before I ever got there I was able to virtually walk the street and understand where I would have sightlines and where I wouldn’t. I had anticipated making an image of the Brooklyn Bridge from that location, but Google Street View showed me I didn’t have clean sight lines to the bridge. Google Earth – Most things in Google Earth are also available in Google Maps. However, there are some features that are exclusive to Google Earth. The one that I really love is the “View – Sun” option. This will show you the current sunlight conditions for the current day. Drag the time slider in the upper-left and you can see the sunlight and shadows change during the day on any day of the year. MSN Maps “Bird’s Eye” – Like Street View, this isn’t available everywhere. It is another aerial map but this one is of a much higher resolution. I can see chairs on my deck in these images! Google Street View’s “User Photos” – Click on that little “User Photos” in the upper-right-hand corner of a Street View session and you will be presented with photographs taken there. Corbis/iStock/Alamy/Other stock sites – These can be a great resource for imagery and since stock imagery tends to be both comprehensive and straightforward, you can continue understanding the layout of a location while getting some inspiration as well. Sunset/Sunrise calculators – There are a wealth of them online as well as for your iphone or other smart phone device. The best show not only sunrise and sunset, but declination, moon phases, twilight times and more. I love both Focalware and Darkness on my ipod touch, which I found thanks to Juan! Official and unofficial websites from your destination – Whether they be the official corporate sites or fan sites or something else, there is a plethora of information out there about any location you plan on visiting. The Lonely Planet and Top 10 Eyewitness Travel series are both excellent dead tree resources. Sometimes the information overload from the web is great, other times a concise book that you can take with you is perfect. Once you have done all of your research, have some shots pre-visualized in your head, picked out your gear to bring and arrived at your destination, it just might turn out exactly as you planned. But be prepared to throw it all out and start over! All of the resources above are to get you better prepared so that when things do change or the unexpected happens, you are able to take it in stride and create a great image. 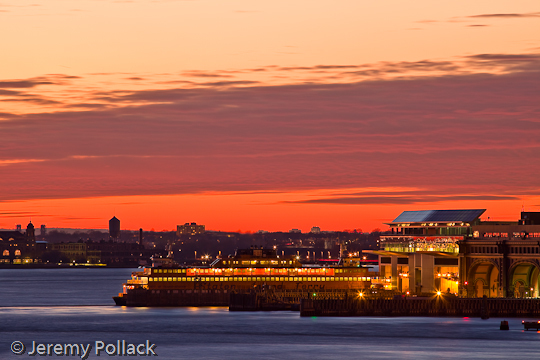 The photograph at the top, from the Brooklyn Heights Promenade is not at all what I had planned on creating, but when I arrived and saw the terminal light up as twilight fell, I simply had to wait for a ferry to return to port and press the shutter. You done good, as they say!